As the market adjusts to solar panels and batteries becoming more commonplace, we’re all concerned with the cost, pricing, and return on investment. 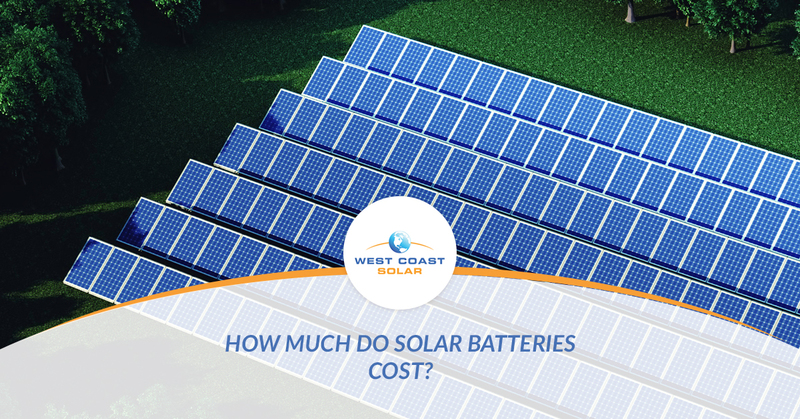 At West Coast Solar, we understand if a solar battery bank seems like a costly investment, but if you review your energy use you may be surprised at the savings you could find when you use a battery bank. In this post, we’ll be sharing how solar storage works and the estimated cost, depending on your area. The first place you’ll want to start before purchasing a solar battery for your energy storage is how much it’s going to cost. In general, you can think about the cost of a solar battery in two ways. The first is in gross cost. As of 2018, solar batteries can run anywhere from $5000-$10,000 gross cost per unit. Alternatively, you could consider the kilowatt per hour (kWh) cost, which can range between $375-$825 per hour. Remember to consider how the batter will function and the type of battery. For example, a battery that’s intended to function off-grid to store energy will typically cost more than a battery built to function tied into the grid. If you’re concerned with the pricing of solar batteries, take note of how solar panel pricing is steadily decreasing. As solar systems are becoming more common and technology advances, the market price will find a steady range. We expect solar batteries to do the same. Check to see if the battery you plan on purchasing has a built-in inverter. An inverter helps manage the flow of energy to and from your battery. Inverters will raise the price of the battery, but it will also offer you an efficient management system for energy within your battery. The cost is worth it to most purchasing a solar battery for their home or business. Would Installing A Solar Battery Be Worth It For You? If you already have a solar power system installed on your home or business, you want to make sure it’s ready to implement solar batteries. This means calling your solar technician from either your installation company or through your operations and maintenance services to ensure you can add a battery bank to your system. Do You Need Solar Storage Financing? Financing for a solar battery bank or other solar storage options is relatively the same as financing solar panels. You have three options: purchase outright, lease the battery, or acquire a loan for the battery. Depending on your financial situation, you will need to determine which purchase path is right for you. Does The Solar Investment Tax Credit Cover Batteries? If you install a solar system and it includes solar batteries, the tax credit does cover them. However, if you install batteries separate from your system install, you will need to find incentives or initiatives elsewhere. The best way to decide whether or not to purchase an energy storage battery, whether for a solar power system or a grid tie-in, is to consider how you use energy. Do you generate energy through a solar system or do you use primarily grid energy? Are you somewhere in the middle? Give us a call and we can help you determine the best route to purchasing a solar battery!